We've taken the most frequently asked questions and included answers to them as a quick reference for you. Start by browsing the website and add the experience you want to your cart by clicking the BUY NOW button. Log in or register. You can do this quickly with One-click log in. You receive a receipt via email and your order is dispatched. We also send you a tracking code so you can check on the progress of your order. Where is the experience held? Please view the experience product page or if you have one, check your booking confirmation for details. The location is included together with a view of a map. Please note that we are only able to disclose full location details once we have received an order or placed a booking. If you are experiencing difficulties ordering via our web site, please contact our customer centre via www.thrillexperiences.com.au/contactus. Can I contact the location before I buy? We provide full contact details only after we are in receipt of an order. Regretfully, we are not able to provide specific contact details of our suppliers prior to receiving an order. If you have specific questions, we can help answer them and where we do not have the information, we liaise with the operator. We accept a wide variety of payments including Paypal, Visa, Mastercard, AMEX, Diners Card and Bank Deposit. Please note that bank deposits can take 3-5 days to clear. Payment by card can be made online or via our automated phone system. Where can I find the availabilty of an experience? The availability for the majority of activities are displayed on our web site within the product pages. Please select View Dates or Instant Book for the lastest availability information. Can I hold a date before I purchase? We are unable to hold a date before a purchase is made. Places are limited and taken on a first come first served basis. Where do I use the promotion code? A promotion code is a great way to save on your experience voucher purchase. To use the code, make you purchase and follow the steps through the checkout. The promotion code can be entered where prompted on the order summary page prior to completing your payment. Any discounts that apply are immediately reflected in the amount owing. Can I lock in a date before my voucher arrives? Yes you can. If you opted for an e-voucher, you already have all the details necessary to complete a booking. If you don't have an e-voucher, please email theteam@thrillexperiences.com.au and an e-voucher can be issued to you within 24 hours. Instant Bookings enable you to book immediately and be certain that the date and time you have selected is available and reserved for you. The dates and times that are displayed within an Instant Booking are direct from the operator that conducts the experience. They are bang up to date, so you can book with certainty and confidence when securing a place for your fav thrill. How long does it take for the voucher to arrive? Vouchers are dispatched same day (Monday to Friday) providing we receive your order by 3pm. We dispatch out of Melbourne and the time it takes for your order to reach you depends on whether you selected regular or express post and your delivery location. An estimate is provided when placing an order. It can be viewed on your receipt. You can also track your items via Australia Post for extra piece of mind. Can I have my voucher delivered outside Australia? We are only able to deliver posted items within Australia at this time. E-Vouchers however, can be delivered anywhere in the world. Will the packaging contain anything that says it's a gift? All the packaging we use is non descript (we wouldn't want to spoil the surprise). There is nothing on the outside of the package that stipulates it is from Thrill Experiences. Will the gift pack fit in my letterbox? The gift box and envelope package options are approximately A5 in size and fit a standard Australian post box. Where the item cannot go into the post box, you can pick it up from the local post office using the instructions left in your post box. Thrill Experiences will process refunds on vouchers provided that the request is made in writing by the puchaser within 28 days of the date purchased and the original voucher is returned intact at the customer cost and received by Thrill Experiences within 28 days. In event of a refund, Thrill Experiences will deduct an administrative fee of 10% (or minimum of $30) from the amount refunded. Refunds will be made within 30 days of us agreeing with the purchaser that a refund will be made. No refund is possible for already booked (redeemed) experiences, Instant Bookings, dollar value certificates, gift cards, gift boxes or direct ship items (physical products shipped immediately). If you cancel your experience with a operator, the operator may charge you a cancellation fee or charge. If an experience is cancelled by the operator an alternative date should be organised directly with them. My gift is not a voucher. How do I get a refund? No refund is possible for already booked (redeemed) experiences, Instant Bookings, dollar value certificates, gift cards, gift boxes or direct ship items (physical products shipped immediately). I have booked in. How do I get a refund? No refund is possible for already booked (redeemed) experiences. How do I exchange my voucher? Vouchers can be exchanged for credit, providing the voucher is still valid, was not purchased using credit and has not been redeemed. Vouchers can be exchanged free of charge for credit of the same value and with the same expiry date as the voucher being exchanged. Credit can be used for full or partial payment of an experience. Credit cannot be used for the purchase of gift packs, postage and shipping. The value of your voucher is displayed and you can transfer it's value to credit. How do I make a booking with my voucher? To make a booking, select Use A Voucher from the top of the web page. You'll need to log in, enter your details and the date and time you'd like to take your experience. Your booking is confirmed within 48 hours via email. The confirmation contains everything you need for the day including the time you need to arrive and directions on how to get there. I need to change the date of my experience. You may be able to change the date or time of your experience subject to the operator's terms and conditions. To request the change, please contact the operator directly using the information on your booking request. Thrill Experiences is unable to change booking dates or times. Can I transfer my voucher after I've booked in? Once you redeem your voucher, your voucher cannot be transferred to another person and the operator will be expecting you on the confirmed date. We recommend you book at least 14 days in advance of the date. Allow longer during peak times such as weekends and holiday periods. If you have not received a booking confirmation within 48 hours of making your booking, you should contact the operator as soon as possible. The operator's details are found on the booking request that was issued to you. How do I contact the operator? When you complete a request for a booking/ redeem your voucher, the operator's details are displayed on the screen. A copy of these details are sent to you via email. If your booking was cancelled by the operator, you can reschedule an alternative date with the operator. We recommend you contact the operator as soon as possible as dates can quickly book out. Each experience and activity comes with its own unique risks. Our experience operators provide us with documentary evidence of insurance that we keep on file. However, for peace of mind, we encourage you to enquire about and view the experience operator's insurance prior to undertaking the experience or activity. We also recommend that you consider taking out your own insurance before participating in an experience. Can I extend my voucher's expiry date? Vouchers purchased on or after 7th December 2017 have a 5 year expiry and cannot be extended under any circumstances. If your voucher has not expired and you wish to extend the expiry date, Thrill Experiences can extend the expiry date for an administration fee of $10 per month per voucher for up to three months, once only. If your voucher has expired and you contact us within 30 days of its expiry we can reactivate it for an administration fee of $30 per voucher per month up to three months, once only. Vouchers that have an expiry date that is over 30 days old, cannot be extended under any circumstances. My voucher has expired. Can I extend it? If your voucher was purchased prior to 7th December 2017 and it has expired and you contact us within 30 days of its expiry, you can reactivate it once only. A reactivation fee of $30 per month for up to 3 months applies. If the activity has increased in price you will also need to pay the difference in price. Vouchers that have an expiry date that is over 30 days old cannot be extended. Vouchers purchased on or after 7th December 2017, cannot be extended under any circumstances. I've lost my voucher. Can I replace it? Vouchers are like a currency that can be transferred and exchanged. Like a currency we are unable to replace lost or stolen vouchers. 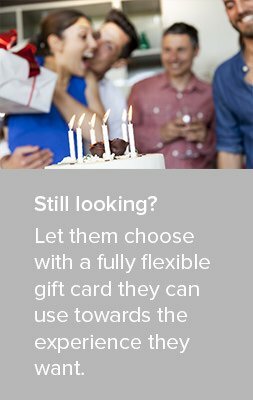 Can I extend my gift card/ certificate's expiry date? If your gift card/ certificate has expired, regretfully we are unable to reactivate or reissue it under any circumstances. How do I use my gift card/ certificate? Start by browsing for the experience or experiences you want then add them to your basket. I've lost my gift card/ certificate. Can I replace it? Gift card/ certificates are like a currency that can be transferred and exchanged. Like a currency we are unable to replace lost or stolen gift card/ certificates. Instant Booking dates are confirmed at the time of purchase and cannot be amended by Thrill Experiences. The operator will have reserved a place for you and possibly worked out the logistics of the event for the day. We recommend however, that you contact the operator as the operator may be able to amend your date. Subject to terms and conditions, the operator may charge you a rebooking fee or cancellation fee.